The return of Israel. Increased turmoil in the Middle East. China and Russia’s presence in the Fertile Crescent. The exponentially increasing technological explosion. The rise of the Sodom and Gomorrah spirit. These are just a few prophetic fulfillments occurring in our day that point to significant biblical times to come. The Bible is 100 percent accurate in regards to the ancient prophecies—and ours is the first generation to see them converging. In itself, this is an unexceptional addition to the tottering pile of evangelical paperbacks that have been sold over many decades on the promise that “ours is the first generation” to see ancient Biblical prophecies converging. Most famous, of course, was Hal Lindsey’s Late Great Planet Earth in 1970, and Gallups appears to have adopted a similar breezy style (one chapter is entitled “Pass the Turkey, Please”, just as Lindsey used desperate puns such as “Sheik to Sheik” and “Russia is A Gog”). Gallups’s book is simply more of the same racket, although it’s worth noting because of the exceptional toxicity of its author and the endorsements it has received. I’ve been aware of Gallups – pastor of the Hickory Hammock Baptist Church of Milton, Florida – ever since he published a video in which he argued that the Jesus had named the Anti-Christ as “Barack Obama”. Gallups eventually backed down from that, claiming that the “leftist media” been unable to appreciate a piece of “political satire”. More recently, he published a book through WND called The Rabbi Who Found Messiah, which claimed that an elderly Israeli Kabbalist had accepted Jesus as the Messiah shortly before his death in 2005, and that this had End Times significance. He is also known for his birtherism and association with Mike Zullo – it was on Gallups’s radio show that it was first announced that Sheriff Joe Arpaio intended to give a final press conference in December about Obama’s birth certificate. An evangelical pastor who led prayers at a Donald Trump campaign rally has been accused of being a Sandy Hook “truther” who claimed that the school massacre never happened and that the parents of the child victims were “Hollywood actors”. .It has emerged that on his radio show Freedom Friday earlier this year, Rev Gallups suggested that the shootings at Sandy Hook Elementary school, where Adam Lanza gunned down 20 children and six staff members in 2012, were a hoax. …”[David Wheeler] played the part of a grieving father with a woman standing beside him, crying, slinging snot,” said Rev Gallups on the show that aired in February. The Trump campaign’s website listed Gallups among a number of Florida “community leaders” whose endorsement it had been “a great honor” for Trump to have received; the page is still live, although after the Sandy Hook comments came to wider attention the campaign’s attitude changed to “I know not the man”. Under pressure, Gallups claimed that he had never endorsed his guest’s view, and uploaded a radio extract titled “Carl Gallups Says Sandy Hook Never Happened? NOPE! Sorry Media Matters!”. However, the original audio is available here. Whatever Gallups’s overarching Sandy Hook theory may be, it is completely unambiguous that he referred to two recently bereaved parents with contemptuous mockery based on a ludicrous conspiracy theory, and that in doing so he degraded the memory of a murdered six-year-old boy, Benjamin Wheeler. Surely such a person should be beyond the pale? Apparently not. 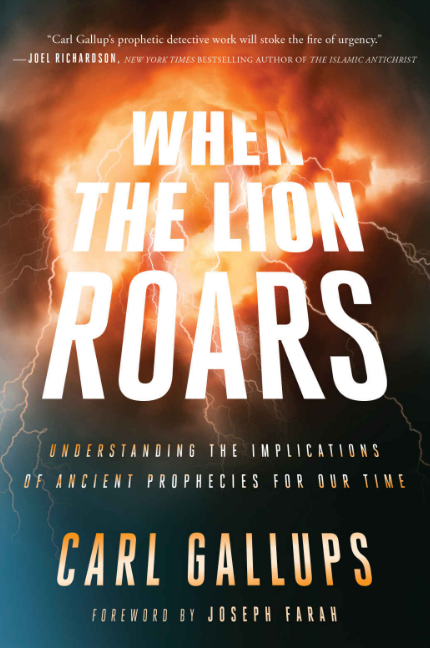 The cover for his new book comes with an endorsement from Joel Richardson, author of The Islamic Antichrist (“Carl Gallup’s prophetic detective work will stoke the fire of urgency and expectancy”), while the first pages feature praise from Pat Boone (“you will become increasingly convinced that we are living in the most profoundly prophetic days since Jesus Christ first walked the earth in the flesh”), Herman Bailey (a televangelist), Mike LeMay (a radio evangelist); and Messianic Rabbi Zev Porat, who uses Gallups’s Rabbi Who Found Messiah book to evangelise Jews in Israel. The website advertising the book also has blurbs from Zach Drew, who is Jim Bakker’s co-host; Cheryl Chumley (author of another WND title, The Devil in DC: Winning Back the Country from the Beast in Washington); Thomas Horn (who blends Christian fundamentalism with David Icke-style science-fiction conspiracy theories); Richard Syrett (“host of the Conspiracy Show and guest host of Coast To Coast AM“); Laurie Cardoza Moore (of Proclaiming Justice to the Nations, a Christian Zionist outfit); Grace Vuoto (“editor of Politics and Culture at World Tribune”; Pastor Mark Biltz (originator of the now-outdated “Blood Moons” End-Times theory); and Gregg Jackson (“bestselling author of Conservative Comebacks To Liberal Lies“). There’s also a Foreword by WND’s CEO, Joseph Farah. Farah is most famous as the man who guided Trump’s birtherism, but he also represents a link between general conservatism and various Christian Right strands. More recently, Farah has produced his own theological opus, The Restitution Of All Things: Israel, Christians, And The End Of The Age, described as “a primer on the Hebrew roots of the Christian faith”. This does not just mean understanding the historical Jesus in his historical context, or a better appreciation of the Hebrew Bible; rather, it is a specific movement that seeks to purge Christianity of “paganism” and appropriate Jewish cultural elements – hence Farah often prefers to write of “Jesus-Yeshua” rather than just “Jesus”. The book also stresses the idea of Jesus’s thousand year rule over the earth as a literal proposition, during which he will “reign with His faithful friends – true believers like you and me”. Farah’s own book comes with a cover blurb by Biltz, a log-rolling endorsement from Gallups, and a further endorsement from Bill Cloud, who has also been promoted by the WND website.